TRNN's Taya Graham and Stephen Janis say city officials' reactions to the black community's calls for accountability reveal the depth of racial divisions in this small eastern shore town. JAISAL NOOR, TRNN: As U.S. cities face a historic crime wave, and police forces nationwide grapple with growing opposition to aggressive tactics, one police chief in a small town has found a way to make crime fighting work. Using community-oriented policing he’s made allies, not enemies, with the people he served. Over the course of four years Kelvin Sewell, a former decorated veteran of the Baltimore police force, became a beloved and respected figure in the African-American community there. This all made the series of events that have unfolded since June so puzzling. Sewell was fired without explanation, and when the community wanted answers they, along with the media, were shut out of public meetings. We’re now joined by the team that’s perhaps done more than anyone to get the story out. Taya Graham and Stephen Janis, our two Real News correspondents that have been covering this. STEPHEN JANIS, TRNN: Thanks for having us, we appreciate it. TAYA GRAHAM, TRNN: Thank you so much. NOOR: So this is a really fascinating story, and the Real News has been all over this. Our viewers, I’m sure, have seen your about dozen reports on this topic now. But this story and your connection with it actually goes back decades, really. JANIS: Well, you know, it goes back to–I’ve known Sewell for quite some time. But really when it started, and the story started, was back in 2010. Kelvin was a decorated homicide detective working one of the most violent cities in the country, and I was a reporter covering a lot of the cases that he worked. And we started to develop a relationship. And he said, you know, I want to write a book about what I’ve experienced because really, policing is not effective in cities like Baltimore. Policing doesn’t work. And I want people to know what I’ve seen. So we–. NOOR: So Sewell was not the kind of officer people hear about in the news for being abusive or committing some type of other egregious act. JANIS: No, no. He was not someone who was ever accused of brutality or anything like that. He was, you know, he was a well respected homicide detective. Also worked in the DEA, drug enforcement. So I think he was probably–and I think he was good at building relationships in homicide, that’s why he was successful at closing cases. So we wrote–we decided to write this book called Why We Kill: The Pathology of Murder. But in it he sort of took policing to task and wrote about how dysfunctional the Baltimore City Police Department was. And he retired while we were writing the book, and took a job as a lieutenant in the small city on the Eastern Shore called Pocomoke City. And he said to me–and we included part of this in the book, that you know, I don’t want to repeat the mistakes. I think policing is broken. I think the idea that you can police without any relationship with the community, you use the tactics that we use in Baltimore, it’s just false. It will not work. And he said, I’m going to try something different when I go to Pocomoke City. I’m going to try a different type of policing. It’s kind of old school, but I’m going to try the community policing. And I think that’s what he [decided to do] and that’s where this story really starts. NOOR: So Taya, we reached out to Pocomoke City, we spoke to the city manager, and he says Sewell wasn’t fired for any improper reason. And he really refused to give any more details. He said his lips are sealed because of very strict Maryland state law around these, around [03:02] personnel issues. So you and Stephen went down to Pocomoke, spent–made several trips there. What have you discovered about Sewell’s firing? GRAHAM: Well, we spoke with councilwoman Diane Downing. She’s a representative for District 2. GRAHAM: She is the only African-American member of the city council. Well, when we sat, we sat in her home and spoke with her. And she mentioned two meetings which occurred where there were no minutes posted, and the public was not notified about them. Essentially these meetings were secret. The first meeting was called as an emergency meeting. Diane told me that when she showed up she was worried perhaps someone had died. She had no idea why the meeting was being called. And she came in and she said that she looked at everyone in the room, and she could tell that they knew something that she did not. She said, well, what is it? Please, just tell me, what is it? And they said, well, we’re going to have to fire the chief. And she was absolutely shocked, because all the feedback that she’d received from the community was very positive. She said, well, what’s your evidence? And they said, well, we have an anonymous tape of him making a phone call, making an anonymous tip to a police department. And she said, well, I want to hear this. Diane D. So all the city council members go to the police department, they sit together in this little room, and they listen to the tape. And the tape is of Chief Sewell identifying himself as Kelvin D. Sewell, chief of Pocomoke City police. And he had received a tip that there was a suspect at large in Snow Hill. GRAHAM: An anonymous tip. Thank you, an anonymous tip. JANIS: Which I think, that’s important to make–because I think that might have been where the confusion was, at least from our reporting, that it was an anonymous tip. GRAHAM: That’s true. It seemed that their concern was hinged on the idea that the chief anonymously gave a tip, as opposed to it being a tip from a CI, a criminal informant, an anonymous tip itself. JANIS: But this is all from reporting, we make it clear that we have not heard this conversation yet, but this is what we, from talking to multiple sources–. JANIS: Not just, not just Diane Downing. JANIS: Well, this is one of several pieces. But we haven’t been able to confirm some of the other things, allegations were made. None of them that she thought, in the letter to the attorney general, were serious enough to, to, to warrant his firing. But that particular piece of evidence, which was reviewed on the 26th, actually was so, I guess, not convincing that the council decided that time not to fire him. But then subsequently on Sunday night she [received] another text from the mayor saying we have to have another emergency meeting, secret meeting, basically, essentially, because they didn’t notify the public. And they convened again on Monday morning, and that’s when the, when the mayor told her, yes, we’re going to have to fire the chief. And they brought the chief in, and they fired him. And all these meetings were conducted without public–any sort of public, any sort of things that are required of a board or a council in terms of the Maryland Open Meetings Act. You know, you have the–and now it’s, there’s going to be a meeting, and then vote to go into executive session, and produce minutes. None of those which were done. So basically that’s what really started this whole problem. The chief was fired without any sort of public discussion or any sort of reasons given to the town. And as Taya pointed out, a beloved chief. Not just a person who was doing a so-so job. He had really connected with the community. So that secrecy, I think, is what started us down this road of how this story evolved. NOOR: And it’s really about the, it’s really the community that made this into a story because they held protests and they organized around Sewell, and this really exposed the deep racial divisions within this town. And the whole Eastern Shore, you could say. For people that haven’t been to the Eastern Shore, Stephen, can you tell us a little bit about the, some of the racial dynamics there? JANIS: Well I mean, you know, it was the place where historically there was–the last lynching in the state of Maryland was on the Eastern Shore. And I think just from my observations there has been sort of this quiet, we’re not going to talk about race and we’re not going to talk about racism. But you know, when you have–when you see what happened in Pocomoke where the African-American community had rallied around this chief who is African-American and the white community, especially the white leaders, have said, you know, we’re not going to tell you anything, and don’t make a big stink about it, you can see that the sort of racism, and the racial mistrust is deep rooted down there. And it is a very, it is a very difficult thing for this town to do, because I think a lot of things that have been under the surface are now coming up. GRAHAM: I would just like to add that this really ignited the political awareness of the community. The Citizens for a Better Pocomoke was formed specifically to support Kelvin Sewell. The majority of the members of the Citizens for a Better Pocomoke are black church folk, primarily African-Americans. There was another group that was formed briefly that signed a petition, essentially telling the city council we support you, we support your decisions, and we support you firing the chief of police. Now, I went to that church meeting to see the petition as it was being signed. They said it wasn’t officially a petition. But to see this document as it was being signed as a show of confidence in the city council. And everyone who’s there was white. So even though at that time we asked people, do you feel that this is about race? Do you feel the firing is about race? Do you feel the fact that the city council doesn’t seem to be responding to your concerns is about race? And everyone said no, no, it’s not about race. But to anyone looking from the outside in the divisions are very obvious. 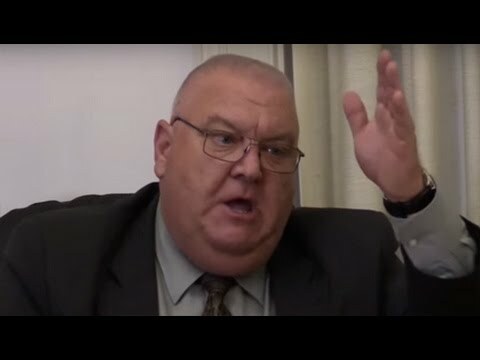 JANIS: And we should note that Sewell’s attorney, with the Washington Lawyers’ Committee, has said publicly that Sewell was fired because he refused to fire two African-American officers who had filed EEOC complaints against the Worcester County Sheriff’s Office. JANIS: Equal Employment Opportunity Commission. Which is a commission that, you know, regulates–or investigates, excuse me, allegations of racism or discrimination in the workplace. So these two EEOC complaints were fired against this sheriff’s unit that Taya talked about. We might have talked about it before, about–who had been conducting raids in Pocomoke. And one of the officers was detailed from the Pocomoke police to this task force and experienced, you know, racial epithets and texts, and–. GRAHAM: For example, specifically, this was Detective Lieutenant Savage. And what he received was texts using the n-word. He had found on his desk food stamps with Obama’s–President Obama’s picture on them. When he went forward to [09:20] register his complaint he received a bloody, dead deer tail on the windshield of his car. So even though they put it in terms of a hazing it was very much racially motivated. It made him extremely uncomfortable. GRAHAM: He felt that he was in a hostile work environment. And more importantly, his complaint was sustained. JANIS: So that, so what Sewell’s lawyers have said is that complaint and the controversy surrounding that prompted the city to ask Sewell to fire Detective Savage and Lieutenant Green, because Lieutenant Green subsequently filed an EEOC complaint. And so–but that, of course the council has never commented on that, and we have asked the mayor, you know, we have asked the mayor and every other city official and have received no response. Or again, saying what you’re saying. But that is also underlying this, from Sewell’s side at least, that it is–the whole thing was racially motivated. NOOR: And so this was back in late June. And ever since then, at every public meeting it seems like that you have been to, there has been, sparks have been flying. And, and in your last, the most recent story you guys did, things ended up getting really tense and things escalated pretty quickly. GRAHAM: As a matter of fact it was Pastor–Rev. Pastor Ronnie White of the Christian Love Ministry who came forward to represent the Citizens of a Better Pocomoke with Rev. James Jones. And he came forward essentially to address the city council and say–well, initially, why were we stricken from the agenda? He had planned to come in and speak on behalf of his community, and he discovered that his name had been taken from the agenda. When he addressed city manager–interim city manager Ernie Crofoot, he said, I have the right to strike anyone I want from the agenda. I make the agenda. After they addressed the issue of the agenda, where I could tell that the Citizens of a Better Pocomoke seemed to react in a way that said they felt that their leaders were being disrespected, their community leaders were being disrespected, this confrontation occurred between Mayor Morrison and the Rev. Pastor. And essentially he accused the Rev. Pastor of going behind his back and giving information to the Lower Eastern Shore News. Well, the mayor confused the Lower Eastern Shore News with The Real News, and accused us of printing inaccuracies and being liars. JANIS: Which I think shows that, you know, what this is all about in a way. It’s about scrutiny of the racial mistrust in the town. Because these things–if a council is accustomed to meeting in secret, which is really against the law no matter how you look at it, or at least against the spirit of the law, and they’re used to conducting these kind of, you know, this kind of business in secret, now suddenly they find themselves thrust not just on a local stage but a national stage. I mean, the Washington Post and New York Times have covered this. And we are there the whole time, and you are seeing I think public officials really having a difficult time of dealing with this kind of scrutiny, this kind of accountability, which you’re not used to. You saw, especially this meeting, those frustrations really came out. The council people, Ernie Crofoot, really became very, I would say, aggressive in their answers to the Citizens for a Better Pocomoke and some of the African-American community. GRAHAM: Absolutely. And even though there’s the spirit of community, the residents are coming together, they’re discussing their concerns, they’re discussing the direction they want their community to go in, the city council seems determined to keep things the way they were. So they continue to ignore Councilwoman Diane Downing’s concerns. They continue to leave important information out of the minutes that they’re supposed to post about their meetings. NOOR: Wow. And so [throughout] this whole process, the Department of Justice became involved, the ACLU stepped in. So talk about, a little bit how outside pressure helped get some more access for the public and for the Real News. JANIS: Well number one, you had the Justice Department come down to a citizen’s meeting that we were taping, and discussed–you know, there were several things that were under investigation, including the cancellation of an election without proper notice for the 4th District, which is predominantly African-American, where the council allowed, appointed, a white person to represent that district. So there were some voting irregularity issues. There were issues with the administration of a grant that had been granted to the community to hire an extra police officer and some concern about where that money had gone. But I think the biggest issue, or what has been the biggest part of the story is the way, you know, the ACLU sort of–I would say we worked with the ACLU simply to get access, because we were denied access to these secret meetings. And we–and the first meeting we went to we were kicked out. And subsequently several officers came up and told us to shut off our cameras. I’ve been a reporter for a very long time, covered council meetings, administrative board [meetings]. I’ve never had anybody tell us to shut off our cameras during a public meeting with the mayor and the city council. So the ACLU has filed two Open Meetings Act complaints on our behalf with the Maryland Open Meetings Act Compliance Board. NOOR: And this, of course, speaks to the importance of independent critical media holding public officials accountable. GRAHAM: And not just the media holding the officials accountable, but the media giving the citizens the information they need to do that work themselves to empower them. Because that’s what’s happened for the Citizens of a Better Pocomoke. The Real News and the other media agencies that appeared at the city council meetings, that asked questions, that revealed that federal monies were mishandled, that revealed that the election of Brian Hirschman as councilman to District 4 had a lot of improprieties involved there, that revealed that Councilwoman Downing wasn’t privy to a great deal of information and that she was, her views and beliefs were being misrepresented by the attorney, the city attorney William Hudson. All of these things that they suddenly have a chance to see for themselves has empowered them to step forward. And now they’re demanding a response. JANIS: And before we did our reporting no one knew about these meetings, or any details of these two very consequential meetings. So I think that that’s the idea of watchdog journalism, right. That really, people think the fundamental concept of journalism is to sit there and find these things out. Not make decisions for people, but to unearth the kind of things where they can decide for themselves. And in this case the entire town was excluded from the process, and now has engulfed the town in controversy. GRAHAM: And can I just add how important transparency is. District 4 didn’t realize that they weren’t going to have the privilege of voting for their representative. The councilman, Brian Hirschman, who’s a police officer from New Berlin, was essentially chosen and appointed by the city councilmembers. There was no opportunity for the public to vote. In the city charter the city council is obligated to post that the position is vacant and that the previous holder of the office had withdrawn from the race. They admitted they did not post that as they were supposed to and circulate it in a local paper. GRAHAM: In a local newspaper. They were obligated to do so. JANIS: That they were going to cancel the election. GRAHAM: That they were going to cancel the election and that the seat was available. They did not do this. So to anyone looking at this it appears quite purposeful, that they wanted to put their own person that they could trust in charge of what I have been told is a 96 percent African-American district, and this is a white police officer from New Berlin. JANIS: And if you look at the way, you know, and this also shows how important the question of policing and politics intersect. That if you don’t have fair representation, you’ll never have fair policing. I mean, Kelvin Sewell, for whatever he did and whatever they’re going to accuse him of, was connected with the African-American community, and they felt like he cared about them, and they felt that he had gone the extra mile, done the community policing. And they lost that. And they lost that because basically there was not–they were not represented in the public office. They were not represented by public officials. So really that shows the–I think the key to policing going forward, the key to police reform, is actual political representation, that people are represented fairly. NOOR: So we’re going to link to all of your stories on this growing controversy in Pocomoke. We know you will be doing a lot more, so we’ll keep our viewers updated. Stephen Janis, Taya Graham, thanks both for joining us. JANIS: Thanks for having us, appreciate it. GRAHAM: Thank you so much. We appreciate it.